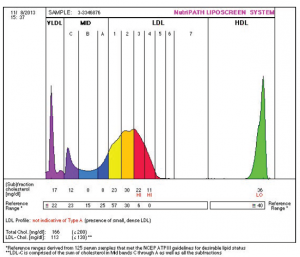 Liposcreen separates and quantifies all lipoprotein sub-fractions including the ‘large’, less atherogenic LDL-1 and LDL-2 and the ‘small’, highly atherogenic LDL-3 to LDL-7. The test also measures VLDL and IDL cholesterol linked with type III dyslipidaemia and associated hyperlipoproteinaemias. Approximately 50% of patients without heart attack have higher cholesterol levels. A considerable portion of heart attack patients have low cholesterol levels. Individual differences exist in particular with respect to the LDL levels and here, even more importantly, in the size distribution of the LDL particles. The small LDL particles in particular have a very high atherogenic potential. Therefore, it is less important how much cholesterol a patient has but which type of cholesterol is elevated and which size distribution the cholesterol particles have. These are the parameters the risk assessment and therapy depend on.